Christmas is a wonderful time of the year. People seem to have a lighter step, a bounce, a smile, are more inclined to say hello and wish you well. But it also seems more commercial than yesteryear. Some if its deeper meaning seems to have faded against the backdrop of the glitz and glam of the consumer season. 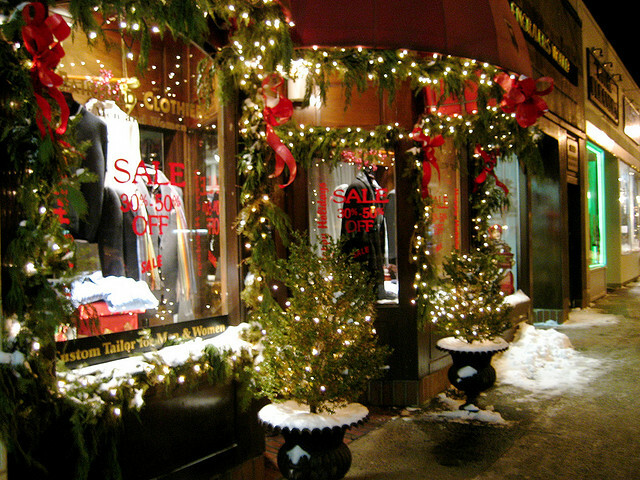 Retailers add holiday bling to store fronts and advertisers go into overdrive (and our bank accounts into overdraft) in response. Following are 25 suggestions (yep, as in Dec. 25) that can add more meaning to your holiday celebrations. The result will be a more profound experience, and perhaps one that will leave you a tad better than you were before: kinder, more generous, deeper, in touch and in tune with what the season is all about. 1. Research the history of the occasion and share what you learn with friends and family. 2. Use the day to connect with people you care deeply about. Get together. Strengthen bonds. Laugh. Talk. Love. 3. Give a creative gift from the heart (something homemade) instead of busting your budget or depleting your life savings, or having to sell a kidney for the money. My favorite was a financially tight Christmas years ago when we all made Christmas ornaments for each other as gifts. We still use them today! 4. Instead of giving gifts (except, perhaps for the younger kids), use the money you would have spent on each other and donate it to a good cause. But make this a family decision – no dictatorial proclamations, or you may be adding a very different kind of meaning to this holiday than the one intended! 5. Volunteer at a homeless shelter or food bank. 6. Create a stocking full of treats and gifts and place it (them) on a doorstep of someone you know has lost their job or has no family. 7. Deliver a food basket to a homeless person. 8. Talk to others about what is most meaningful about the holiday. Simply having this kind of conversation will underscore its significance for you. 9. Write a letter telling someone you love (or someone you need to forgive or who you’ve offended) how much you care for them and appreciate them as you wish them a Merry Christmas. 10. Make doing a good deed everyday from this reading to the end of the year an annual part of your Christmas tradition. 11. Go to church/synagogue/temple as part of your celebration. 12. Find an inspirational movie about the holiday and watch it with family and friends. Our favorite is the Frank Capra classic It’s a Wonderful Life with Jimmy Stewart. 13. Sit down with your family and establish some new traditions that will build meaning into the season and into the future. One of ours is to deliver cookies to neighbors and friends on Christmas Eve, then sit down and watch It’s a Wonderful Life together. 14. Deliver cookies to neighbors, family and friends. 15. Go Christmas caroling at the burn victims ward. 16. Visit a shelter for abused kids to read books or play games with them. 17. Read How the Grinch Stole Christmas or A Christmas Carol or Little Women or any other favorite work that touches on deeper elements of the holiday. 18. Read the Christmas story in the Bible to see how it all got started. 19. Learn some of the symbolism of the Christmas tree, the candy cane and the stockings. 20. Have each of the kids choose one of their gifts to take to a poor family who won’t otherwise have much of a Christmas. 21. Set up a hot cocoa stand near a freeway overpass or anywhere else homeless people congregate in your town and give hot cocoa out for free. Or set it up in the parking lot of a local shopping center or mall just to be kind. 22. Visit your grandparents (or a convalescent home) and ask them to tell you stories about Christmas when they were children. 24. Call the holiday by name. Refuse to use meaning-sapping words like winter-break and holiday tree, or to wish people “Happy Holidays!” Wish them a “Merry Christmas” or “Happy Hanukkah.” Only silly people will object and they need to get over their silliness anyway! Lovingly help them. 25. Give the gift of living better, kinder, more honest, more committed to your family, gentler, with more courage and compassion and love and forgiveness, more faithful and hopeful and positive and thoughtful as you finish the year and begin a new one. And let that be the ultimate gift and the ultimate meaning you attach to this wonderful, sacred, joyful time of the year. These are just a few of my thoughts, but would love to hear yours! How do you add meaning to the holidays? Oh, and have a very merry Christmas! i find your suggestions quite helpful and i look forward to this years christmas because for the first time we would be hosting a couple of university students who cant go overseas to spend christmas and we are excited. it’s also been a busy week spending 30mins at the station yesterday with the kids and members of the church i attend giving out free mince pies, hot tea and fruits to people going in out of the station. it’s been a funfilled experience seeing people stop, smile and chat for a few minutes despite being in a hurry to go to work. we shall be putting up the christmas tree when i have finished reading a few blogs laugh!!! take care and enjoy the rest of the day. Thanks so much for stopping by! And Merry Christmas to you too (also in advance). It is a wonderful time of the year (as has been said — and sung — before :)). Sounds like you guys have your holidays packed full of meaning. But only eight days from Christmas and just getting your tree up, eh? I think it was our first or second year as a married couple, poor and struggling, that we waited until all the trees were something like 75% off before we put one up. It was Christmas Eve! Haha! Have a deeply merry one, my friend! Oh Ken…this is LOVELY….every suggestion is a meaningful way to increase the Christmas spirit not only in our own hearts but in the hearts of family, friends and even strangers. I am not at ALL surprised by the altruistic flavor of this post…your kind and generous spirit is always so palpable in your writing. So, that said, here are some of my favorites from your list….#4…two years ago, since the extended family’s “children” were all grown, I suggested that we each make a donation (of any amount) to the charity or organization of our choice and then, at Christmas Eve dinner, we would go round the table and share where we donated,what the organization was about and why we chose that particular charity. It has been a wonderful way to celebrate Christmas for our family. #6. Create a stocking of gifts and leave on the doorstep of someone who has had a rough year…I LOVE that idea, Ken…I’ve put it on my list of to-do’s. #10…do a good deed everyday from now until the end of the year…can you IMAGINE if everyone committed to that wonderful task? How incredibly joy-filled our holiday would be! #21 Set up a hot cocoa stand…how FUN…so whimsical and yet comforting and loving at the same time!! #23…this is something we do each year. We live way out in the country and our home can not be seen on the road…however, we have acres of paddock fencing for our pastures and we put Christmas lights on a long run of the fencing (this year we did the tiny white lights but we sometimes do the multi-colored lights) AND every year our elderly neighbor (a recent widow) whose property backs up to ours about 15 acres back, calls us to thank us for putting up the lights for her to enjoy…we have come to refer to our lights as the Marie lights and we know that we can NOT put them up because, Marie would be disappointed. And, finally but most importantly, #25…give the gift of living better….this is a gift not only for ourselves but for the people whose lives we touch as well. We are all ever-changing ever-improving gifts…we owe it to ourselves and to our love circle to increase our capacity for love, forgiveness and compassion. Thank you Ken for such a meaningful post. I am very grateful for you and your friendship. Merry Christmas to you and your family! I LOVE what you did with #4! That sounds like such an awesome idea to make the donation first and only reveal the charitable recipients over a Christmas Eve dinner. The stockings idea is an adaptation of two different ideas I’ve participated in. Part of it was my memory of helping stuff stockings for poor kids with my family when I was a kid. It was either the Lion’s Club or the police department behind the event.Some years ago, we would bake cookies, put a plate of them on a needy family’s porch with a note, ring the doorbell, then run and hide. Later, we decided to ring the bell and hand them the plate of cookies so they would have the human contact too. Both ways felt really good, though. I think (hope!) a couple weeks of daily good deeds would feel so good that the acts of kindness would be continued and even habituated into a regular and natural expression of character. And yes, Claudia, how wonderful that would be! The hot chocolate idea actually came from an experience I had one year Christmas Light watching. There’s a street every year that goes absolutely crazy putting up lights and fake snow and trains and Santas and snow men and elves and really going all out decorating that people drive from all over the place to see the houses. People also park along neighboring streets, get out and walk up and down the street. One year, one of the houses did that with hot cocoa. It was just such a kind and thoughtful thing to do. Another year, one of the home-owners (they are all very large and beautiful homes, owned by very well-to-do families) stood out in front and passed out toys (very nice ones too) to young children who walked by her house. It was all just so touching! That’s really sweet that your neighbor calls to thank you for putting up the lights. It’s those little things that really count, that makes people feel special. Thank you so much for sharing your thoughts — they are all so beautiful! PS: One of the sweetest gifts I’ve RECEIVED this year has been the gift of your insight, kindness, encouragement and dear friendship. Thank you for each of those gifts, Claudia! Hi Ken! Hi Claudia, Hi Ayo! This is a comprehensive list Ken! I’m enjoying some of these – particularly #3 – I love making gifts! I’m so glad you enjoyed the list. It was fun to write. Part of it came from thinking about what I can do to add more meaning to my own Christmas holidays. Part of it came from my memory of things we’ve done growing up. And some came from things we’ve done more recently as a family. Hope your Christmas is filled with everything wonderful and beautiful, Lori! It seems to me that absolutely everything about Christmas is grand and wonderful. I especially enjoy that “charitable trait” that emerges in so many people at this time of year. Many, many people have have been devastated by the economy, catastrophic weather, war,and who knows what else…yet, even some of the hardest hit are finding ways to share a bit of themselves with others. Having a charitable heart is the grandest gift of all :-)! Jon Sollie recently posted … Please Reward Yourself By Sharing With Others! Thanks so much for stopping by and sharing your thoughts here! I couldn’t agree with you more, Jon. I love everything about this time of year. It is “grand and wonderful” as you say. It is something truly amazing about the human spirit, that those who have been so devastated b y tragedy still can do such beautiful things and engage is such charitable giving of themselves even when you would think they had nothing left to give. All so inspiring, isn’t it! Thanks so much for adding that dimension to the discussion. Charity, indeed, never fails! And all the best to you too, Jon! You’re welcome for whatever insight you found valuable and I thank you for the added insight you provided us here. I’m delighted that lot’s of people are talking about giving less material & more heart felt gifts. I’ve been trying to get my family to play along with the “give to a charity idea” instead of folks like me that don’t need more stuff, but it hasn’t happened. I enjoy helping others, caroling, and remembering my blessings. Tis the Season to remember God, spirit and all that nourishes us. Hi Brad! I’ve noticed that same thing. I’ve read a huge number of posts these last couple weeks that stress giving more heart-felt gifts, like you said. That’s the hard thing about other family members not quite catching the spirit. Maybe you could start small, perhaps taking a small amount of the money you ordinarily spend on gifts and asking family members to come up with ideas for what charity to send it to. Pick a day and maybe draw suggested charities from a hat, then send it off. Make a big to-do about it. Then talk up the lives that will be helped by it. Make them feel really good about what was done, however little it was. Then try to ratchet it up a bit every year or so. Gift giving can be such a powerfully emotional experience. Many people feel like giving gifts to their loved ones is an important expression of that love. To cut it off in one fell swoop can be threatening. Give it a try and let us know what happens! As for caroling and helping others, there’s nothing like sending little sparks of joy into others’ lives. It adds to the overall glow of living! God bless you in all you do and try to do. Those intentions and efforts are not lost. All we can do is what we can do within the context of our lives and circumstances. So keep taking those steps trying to help others catch what you already so clearly see. And keep giving and sharing, Brad. Hello Ken, Merry Christmas! I love all the items in your list. I can only think of one sentence to sum it up, ‘The true spirit of Christmas is giving and sharing.’ I always hope that during and after the holidays, I will become an even better person. Keeping track of oneself using your suggestions will likely guide me to do it successfully. Thanks! Hi Amy! So glad to meet you! I’m thrilled you liked the list. I couldn’t have summed it up better than you did, Amy: “The true spirit of Christmas is giving and sharing.” Perfectly said! I think the idea of creating traditions can be such a powerful tool in establishing patterns of behavior and thought. But it’s relatively easy to engage in certain behaviors on a day or during a season. They’re good at inspiring growth and improvement, but not so great at actually changing us unless we let the season sink down inside of us a bit. What is much more difficult — for all of us — is the sustained effort at making a behavior an expression of an internal trait because it has to be persisted in. But I agree with you — and feel the same exact way! The season can have a powerful effect on our hearts. And changed hearts are often the first steps toward changed lives. So I hope the list can provide both of us with the needed inspiration and heart-changing experiences to help us take those steps at permanent spiritual and character growth! Thanks so much for stopping by, Amy. Have a Merry Christmas! Thank you so much, Angel. It’s kinda funny that I don’t really mind all that much what advertisers and businesses are doing with the holidays. It almost seems like I absolutely should, but I don’t. While I’m right with you in regretting the effect of a commercialized holiday, the message and meaning of the day having been largely bleed dry of it’s original significance, I don’t place the blame at the feet of the corporate world. So it’s really up to each of us to take a stand and establish the boundaries of what is right and wrong and what range of acceptable attitudes will be allowed in our own hearts and minds. This way, it doesn’t really matter how much money Nike or Mattel or any other company sinks into its ads, we will be internally driven, flying over the tide. And then, like you said so well, we can start to focus on the things Christmas was meant to remember, honor and celebrate. Thanks again for coming by and sharing such wonderful thoughts about what the time is supposed to be about, Angel! I like number 2…I haven;t seen my family for couple for months and I want so spend each minute connecting and feeling them!! I’m right with you, Anna! While I see my family more regularly, it seems, my favorite part of any holiday is still family get-togethers. Still, I recognize that not all people have families that invite warm feelings and fond memories. Some people were raised by some pretty despicable people, as a matter of fact. For those wonderful people raised in very unwonderful circumstances, I would recommend creating new memories filled with new traditions of love and warmth and friends. I agree with you about the importance establishing new traditions with the family. So many of our traditions are handed down (I know, that’s what a tradition is! :)), but we sometimes don’t think out our traditions in a way that can enhance the depth of meaning we experience together with just a few tweaks or one or two additions to the holidays traditions we already have. But yes, family is so important. And it’s important to make sure we create families that want to spend time with us during this time of year. Take care, Dia! Thanks for stopping by and leaving a comment. And have a Merry Christmas! This is truly a gift of a post … beautiful! Thank you for giving this, your gift, to others!! All of these suggestions are wonderful! It makes me wish we’d all apply these 365 days a year, not just a few! Offering to decorate people’s homes or Church is something to add I think. For the past three years, I’ve been doing this with my mom and our church (we start tomorrow!) and it’s become something we greatly look forward to. I also run a local soup kitchen (all year round) and I’ve made them special Christmas gifts that I give out during the Christmas dinner – something I involve my child and mother in. Truly, there are so many ideas and so many beautiful opportunities. Ken, you’re a good, good man with a kind, giving soul! Finding you and a select few others this past year, has been such a privilege for me and I’m truly a better person for it … so my abundant thanks to you! Please continue to be you and put out such goodness in the world! Wishing you and your family the most blessed and wonderful Christmas and New Years!! Elena Patrice recently posted … Is Your Website Relationship Like a Sad Country Song? First of all, thank you so much for your wonderfully kind words. You are such a positive voice ringing so beautifully out there. Secondly, what a great thing you and your church are doing! I had never thought of decorating other people’s homes for them. But there must be countless people who are just too feeble or sick to get up and decorate and are missing out on that part of the season. Thank you so much for adding that suggestion to the list! Have a wonderful Christmas and New Years, Elena, filled with love and joy and the beauty of giving and the profundity of the season! Hi Ken I just found your blog through Steve’s list of the top #50 PD blogger of 2011 – Congrats! This is a fantastic post and a great reminder of what “the holidays” are all about. Unfortunately, consumerism has center stage once again, but it’s reading things like this that really shed light on the true meaning of the season. Thank you for inspiring. My wife and I are going to implement as many of these as we can within the next couple of weeks…and then keep going throughout the year! Materialism and consumerism is the name of the game these days, for sure. And maybe it’s not only center stage, it’s pushed everything else off the stage altogether! But I don’t begrudge that so much as what WE have done either in response to or simultaneously in diving head first into the meaninglessness that a single eye to the shopping culture has created. I’m okay with commercials and window displays as long as we don’t throw the meaning and significance of the holiday out the window as we speed off to the store. And that’s where we come into the picture. We can keep the meaning front and center as we do exactly what you and your wife are going to do. You hold the key in your hand to unlock the beauty of the holiday. And I love that you’re planning on using it so liberally! And I LOVE that attitude you shared: “and then keep going throughout the year!” That, Joe, is the heart and soul of what it’s all about! Christmas time is a time filled with hundreds of small tasks and tight deadlines. But the rush and craziness can be slowed down to make time for some of the items on your list. In that light, I put on a Santa hat and a smile today when I went shopping. And I saw many more smiles coming back at me than ever. Later, I’m utilizing #1 and #3. Then tomorrow I’ll find a couple more from your list to bring meaning & smiles to the holidays. Thanks for your suggestions Ken. And CONGRATULATIONS on winning Best Personal Development Blog of 2011! You make an excellent point: I’ve been last-minute Christmas shopping on Christmas Eve too many times to deny the role of timelines in produce a bit of a rushed frenzy during this time. One of these years I’m going to actually follow through with a plan I came up with some years ago and as yet have NEVER implemented: to shop throughout the year, perhaps particularly taking advantage of sales here and there so that I’m completely done come December. If/when I do this, I will have freed up a ton of time to do almost nothing BUT fill the year with meaning and significance. And the same concept can be applied to going the more home-made route as well. If I start making gifts or giving other less traditional types of gifts, spreading it out over the year, I will still free up a ton of time for other things additional acts of meaning. I think what you did when you wore your Santa hat while shopping was simply beautiful. What a spirit of love and a desire to simply make people smile during the season! I’m glad you’re going to come back and try other tips. That was the underlying purpose of creating it, for a resource of tips for people to gather up a few ideas, try them out, then come back and try few more. Thanks for your kind congratulations, Rusty. And have a very merry Christmas filled with people who you love and who love you! Ken, first off, congratulations on your blog success! You have done some incredible work, my friend. Second, these are incredible ways to enjoy the holidays! I particularly love the idea of the hot cocoa stand and think I might put that into practice myself this year! All the best to you this Christmas! Thanks Bryan! The honor hit me out of left field, for sure! I was hoping to be in the top 50, but was not anticipating this! I’m still floating! I love the hot cocoa idea myself. I haven’t tried it, but saw someone do it once and was so touched by the thoughtfulness. Please give it a try and let us know how it goes. That would be incredibly cool! Thanks again for the congrats and the Christmas wishes, Bryan. And you have an awesome Christmas filled with love and happiness and tons of meaningful activities to enrich the Christmas season! After going “all out” at Christmas for years, I decided last year to kick back and give myself a holiday. Kinda sad to not have the house decorated from top to bottom with enough lights to blow the neighborhood transformer. But I was so much more relaxed. This year, too. It was great for all the years I loved doing it, but when it became something I should do instead of something I loved to do, my alarm went off and told me to readjust. So now I enjoy it vicariously! Haha! Galen, were you one of those houses people pulled to the side of the road to gawk at and the power company sent you Thank-you cards every year? 🙂 I wonder if there will be a comfortable middle ground somewhere in the years to come…. We personally have always decorated, but never went crazy with it, keeping things fairly subtle. We just couldn’t afford all the stuff that would be necessary to create the Christmas extravaganza the transformer-blowing houses can create. But I have always admired them. They’re still a part of our Christmas tradition, as a matter of fact. We go look at Christmas lights every year. Well, Galen, it sounds like you have certainly earned a respite. So take it easy, enjoy others’ decorations and enjoy the peace of the season, my friend! I love that photo! It makes me happy just looking at it. My favorite Christmas gift is the cards we give eachother on Christmas morning at breakfast, which reminds me of your letter idea. The special words touch my heart! I hope you and your family have a very Merry Christmas! I love that idea, Wendy! As a matter of fact, I’m going to introduce it to my family this year as a new tradition! I’ll start with my 5 year-old tomorrow, helping him create one for mom. This is going to be fun! Thanks for the awesome idea, Wendy! I’m excited about getting started! I wish you an incredible Christmas filled with everything the season is supposed to mean and represent. Thank you! I’m so glad you liked the idea 🙂 My son and I are working on Daddy’s card this afternoon too! Merry Christmas! Hapyp HOlidays to you too! As you said, sometimes the simplest things really are the best. That reminds me of a story I heard told by an adult woman who attended the funeral of a high school teacher she didn’t know. A family member went up to to thank her for being there. When the woman was asked how she had known her dad, the woman told the story of how she had decided to kill herself in high school unless someone said hello to her that day. So she went through the day feeling as invisible as she always did and so resigned herself to end it all when she got home. Just then, this teacher whose funeral they were at, walked by and entered his classroom, then, suddenly walked back out and said hello to her and talked with her for a while. That simple act kept her alive. And she grew to be happy and married with kids and living a wonderful life. Like you said, Noch, it’s so often in the simple things we do that we make the biggest difference. And the teacher never even knew the effect he had on her! Hi Ken – awesome story. to know we sometimes influence other people positively even though we dont intend to! Have a good one this weekend! Yeah, we just never know the good we’re doing. It’s like that ripple idea. We send out ripples with our words and deeds and attitudes and we never know whose shore they wash up against. Such a motivation to me to do my best to treat others kindly. You have a lovely weekend too, Noch! Ken, I so resonate with your personal biography, your interests, your reading, and your values. I’m so glad we’ve connected. I personally am not of the Catholic faith, but I am Christian. I found a Catholic radio station lately, and I’m so impressed with the level of character and education of many of the priests who share on the radio. Consequently, I’m deepening my appreciation of Christmas and what it means. Also, on Pandora.Com, you can select Christmas ‘channels’. Listening to songs regarding the message of Christmas is also deepening my appreciation of Christmas. Hey Steve! Sounds like we’re kindred spirits here! Keep doing what you do at Personal Success Factors. You’re making a difference. I never thought of looking up Christmas channels on Pandora. I’ll do that tomorrow — Christmas Eve! Christmas music can be so inspiring. It adds something profound to the season, especially those that speak directly to its meaning: Silent Night, We Three Kings, and so on. One of my favorites is the Little Drummer Boy. I love the message in the song of being but a poor boy with nothing to offer but what he has to offer: a song on his drum. That’s what we do too, right? We offer who we are and what we have, doing our part at sending a positive message out into the world, hoping it touches a life, lifts a spirit, encourages a haggard traveler of life. Thanks for the comment, Steve. And have a deeply rewarding Christmas! Ken, I really enjoyed your list! My favourite gift this year was a handmade quilt. Next year I hope to make gifts for close friends and neighbours. I have a great recipe for cranberry sauce! When my kids were born, I had several aunts and friends who hand-made them quilts. Those were some of our favorite baby-shower gifts too! My favorite Christmas to-date was a year everyone in the family dispensed of the regular store-bought gifts and made Christmas tree ornaments for each other instead. We still use them and love them. Thanks for taking the time to come visit and share your Christmas plans for next year. I think I’ll recommend to my family another round of ornaments for next year. Thanks for that inspiration, Colleen!